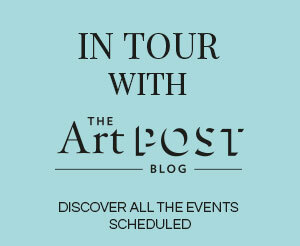 Can you make an exhibition trendy? Yes, you can. 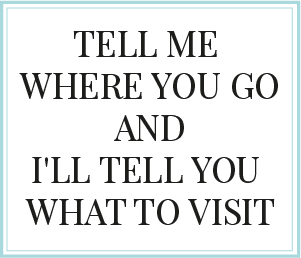 And you must do it! 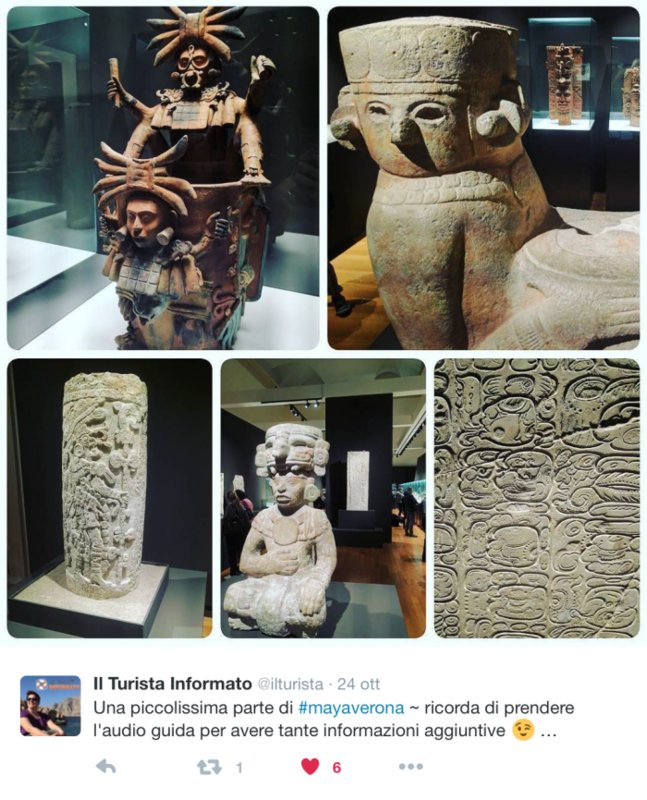 This is one of the tweets I published between October 23rd and 24th 2016, when I came back to Verona to visit the exhibition dedicated to the Maya together with some friends. 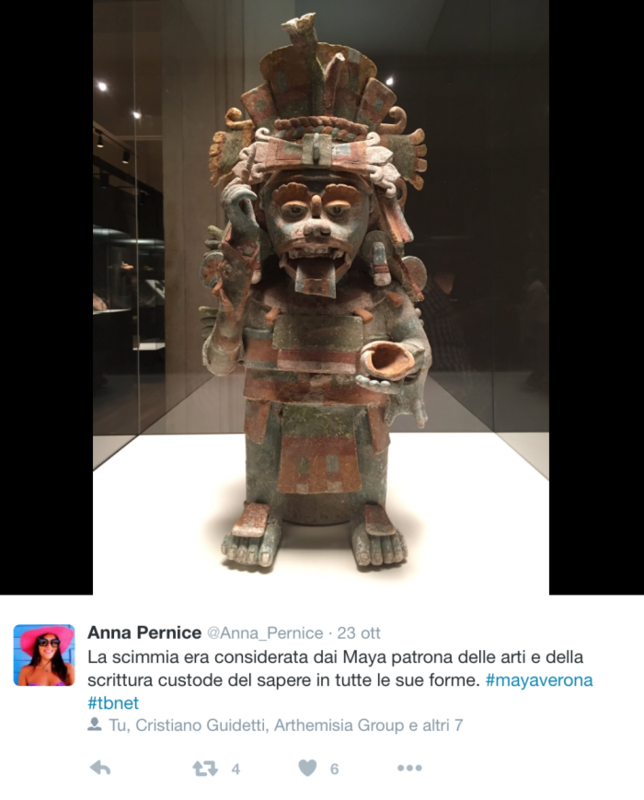 My friends were bloggers like me: some made a long journey and they looked forward to losing themselves in the atmosphere of the Maya they lived in Mexico and in the places which the artefacts exhibited in Verona come from. 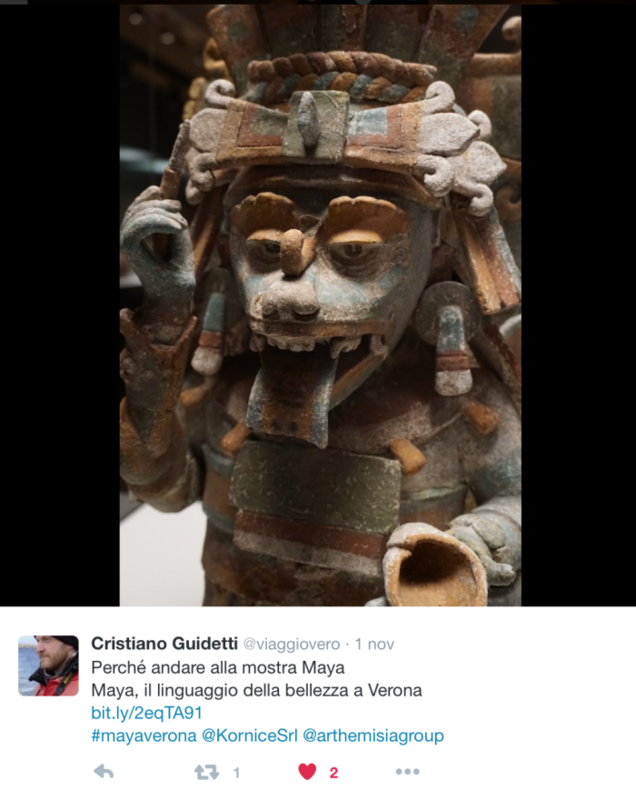 Others were fascinated by the subheading of the exhibition, “Il linguaggio della bellezza” (“The language of beauty”), and they wanted to understand what the beauty for the Maya was. Still others wanted to offer their children a useful and funny experience. Then there was me. 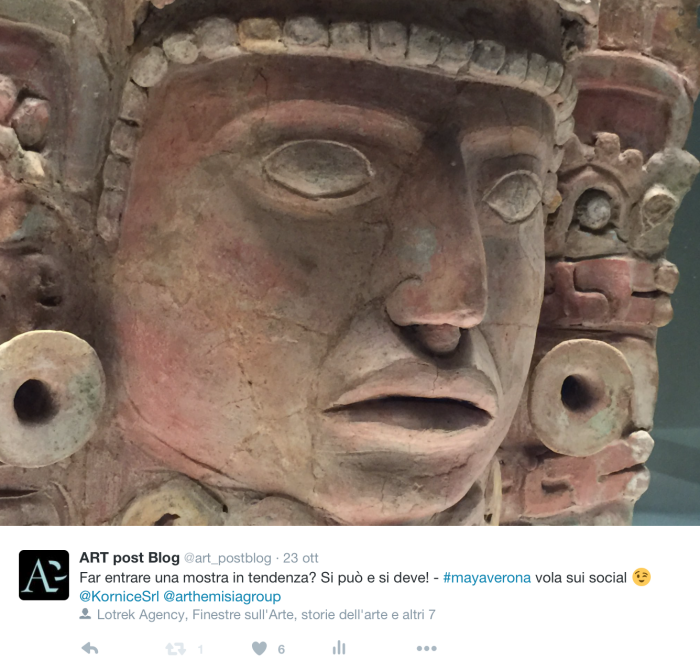 I witnessed the birth of the exhibition dedicated to the Maya, and I shared with you the images of the inauguration on the social networks, and I wanted to transform the exhibition into a carefree moment and an opportunity for interaction. 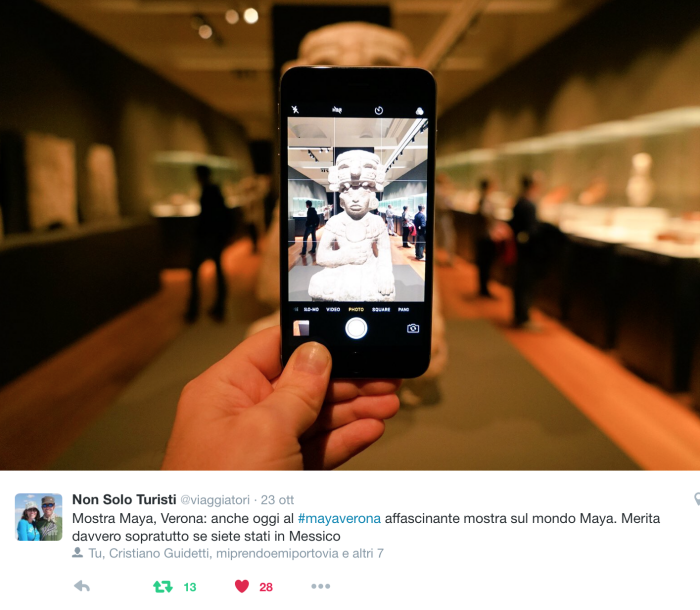 But this moment was something more, because all participants wanted to share what they were seeing, and that made #MayaVerona a Twitter Trending Topic. 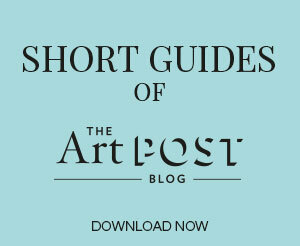 Probably it’s the first time in Italy that an art exhibition has become a topic so popular that it has become trendy. 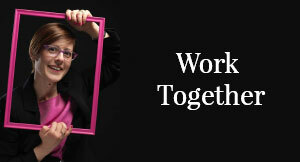 I’ve told you that because it makes me think that there’s hope; that culture and cultural proposals can attract a wide public, and we can do great things together. 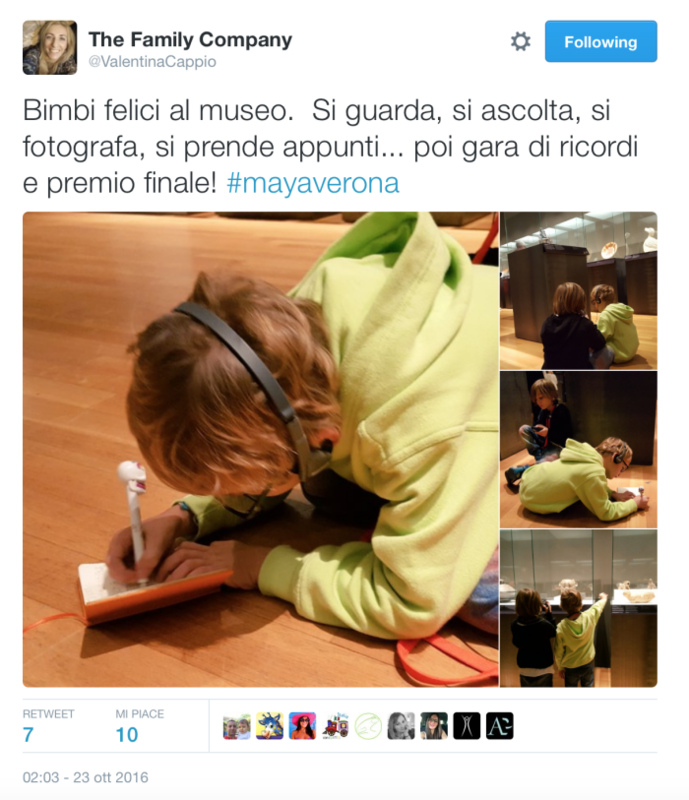 The bloggers who came to Verona together with me wrote some posts on their blogs, as well. 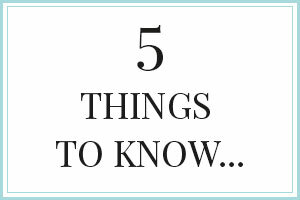 Follow #MayaVerona to find the links and read them all. Che piacere ricevere questo commento da te. 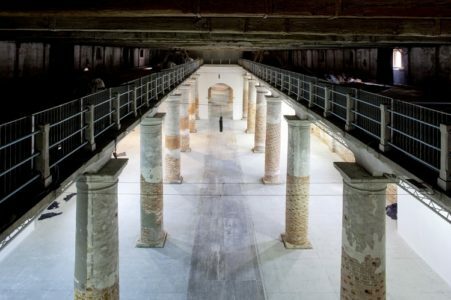 Sono convinta che si possano fare tante cose belle, anche se certe volte mi sembra di essere come gli impressionsti che lottavano contro gli accademici ancorati al passato. C’è tanto da fare e tanto da conquistare, ma anche tanti pregiudizi da sconfiggere. 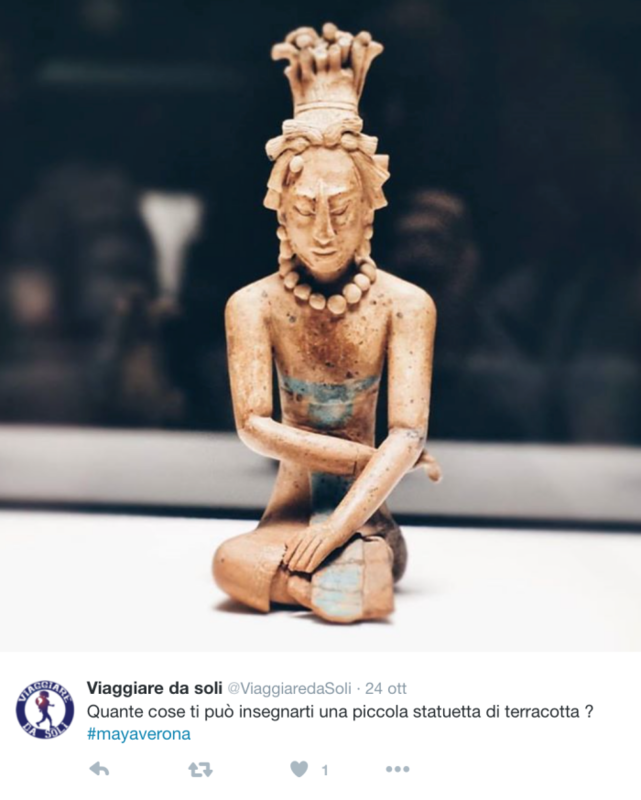 Sono positiva però. Si può fare!